If your employer offers you an employee stock purchase plan and you are not participating, you may be leaving thousands of dollars on the table. Many people put off enrollment for many reasons, but the biggest is because they do not understand how their employee stock purchase plan works. How about we cure your confusion and give you the information you need to understand your employee stock purchase plan and determine whether you should enroll. Missing out on a great plan could mean that you are leaving thousands of dollars on the table. Use Level Up’s ESPP Estimator to quickly calculate return on investment & potential tax impact. Your employer stock purchase plan is free money. Employers set up an employee stock purchase plan to incentivize and reward employees. Participation in the plan is optional. Employees must sign up during their plans enrollment periods. 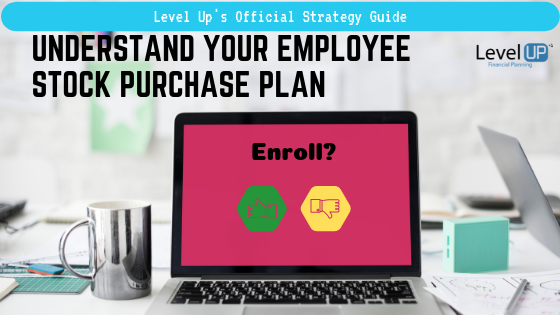 Employees who enroll in the plan purchase their employer’s stock at a discount. The discount varies as you will see below. The logistics of purchasing shares and the tax impact is complicated but will be addressed throughout the rest of this strategy guide. The maximum amount you are allowed to apply to your employer’s stock purchase plan may vary. It is usually set as a maximum percentage of eligible compensation. There is also an IRS imposed limit of $25,000, which is calculated on the pre-discounted value of shares. The discount is the free money I was referring to earlier. Not all employer stock purchase plans are alike though. There are two ways discounts vary: discount percentage and reference price you receive the discount on. 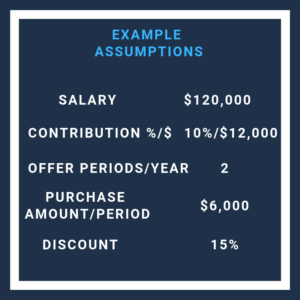 This example does not reflect a common result, but it shows the potential additional value that could occur during volatile markets. 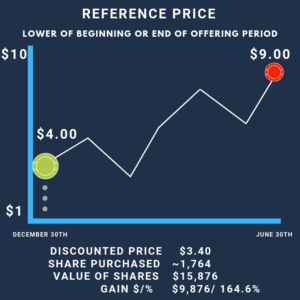 If this graph was inverted and the value fell over that time period, then the worst case scenario is the return potential would be identical to the first graph where you only purchase shares based on the value at the end of the purchase period. The offering period is the time period when you pay into the plan, but before the shares are actually purchased. The most common length of offering periods that I have seen with my clients is one year, but periods can vary. The purchase period is when your accumulated savings into the plan are deployed with the discount applied to purchase your employer shares. An offering period may contain more than one purchase period and the most common intervals I see are two six-month purchase periods. After your purchase the shares you are officially the owner of the shares and can decide whether you would like to sell or keep your shares until a future date. Unlike other stock benefits that you may have like Restricted Stock Units or Non-Qualified Stock Options, you may be able to avoid a taxable situation when you purchase your shares. Instead, you will face taxable events only once you sell your shares. The tax treatment varies depending on the length of time you have held the purchased shares. Remember that you can pick and choose how many shares you sell. You can choose to sell just a few shares or you may choose to sell all shares. If you have accumulated shares over multiple purchase periods, you may have varying tax implications depending on the lot of shares you decide to sell. Level Up’s ESPP Estimate Projects Initial Tax Impact Too! 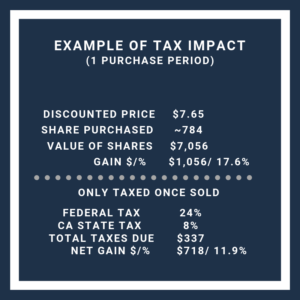 When you are taxed on the discount is tied to the sale date, the discount received at purchase will be treated as ordinary income the year the shares are sold. The only time this taxable amount would be reduced is if the value of your share falls below the purchase price. This is where the taxes start to get a little messy. There are specific IRS guidelines to follow in order to receive the preferential capital gains tax treatment on any gains above the purchase price. Failing to meet the requirements may result in a higher tax impact potentially. Failing to meet with of the above requirements means that your gains will be treated as ordinary income and are taxed at ordinary income tax rates. There are a lot of moving parts with Employer Stock Purchase Plans, so it makes sense to put off enrolling in a plan you do not understand. Hopefully, this guide has resolved some the anxiety and helped you determine a clear way to analyze whether your plan is worth enrolling in. If your monthly budget is already tight it may make it tough to pull the trigger on another line item that reduces your paycheck. Do not let this reason be the deciding factor in why you do not enroll. Find a way to reduce the spending that will allow you to receive the free money from the stock discount. Reducing your spending while simultaneously increasing your overall compensation will only do great things for your financial situation. Taxes do ultimately reduce a portion of the free money you receive from the discounted shares, but only in the same way that taxes reduce a pay raise. Pay raises are always a good thing even if you lose a portion of it to taxes. You may not think very highly of your current company and that would normally be a strong reason to not purchase company shares. However, if your employer opens up the door for free money, you should consider it. The great thing is that as soon as the purchase occurs you can place the sale of all of the shares and you are free from the exposure of your company’s stock. You still have to pay taxes on the free money you received, but you can see from the example above that you always come out ahead. Are you actively searching for another opportunity? Best of luck finding that next gig, but it may take longer than you think. Even if you were to transition in the middle of an offering period, you end up receiving all of the funds that you had withheld from your paycheck. 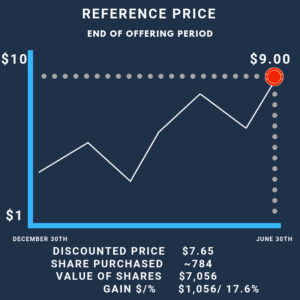 You will not receive the discount or shares in the company. If you want to lock in your guaranteed return from your employer discount, then you need to sell your shares immediately after they are purchased. Just do not forget that this will increase your taxes and you may want to consider quarterly payments or increase your tax withholding with your employer. You are still looking to lock in your guaranteed return, but if you are concerned about the tax impact than you essentially can apply the proceeds to your Traditional 401(k). If you deposit the funds dollar for dollar on the discount than you effectively negate the tax impact. Be aware that you have to be comfortable with not being able to access your retirement contributions at least until age 59.5. Remember you have to meet both requirements, but by doing so you are able to receive preferential tax treatment on any gains that have accumulated above the value since you purchased your shares. This makes sense if you believe your employer’s shares will be more valuable in the future than they are today. Additionally, you would also have to believe that these shares will perform better than the general market. That is because it is not rational to take on the great risk of owning a single company if you only expect it to perform the same as a lower risk diversified investment. You may still want to make sure you meet the requirements of a qualifying disposition, but in this strategy, you are strategically waiting until a low-income year to sell your shares. This will allow your discount, which is taxed at ordinary income rates, to be taxed at a lower bracket. I mentioned it periodically throughout this strategy guide, having employer stock is a high-risk investment. Do you feel that the possibility for high reward justifies the risk you have tied to your employer stock? A general rule of thumb is to have no more than 10% employer stock, but that is only if you have an extremely high threshold for risk. If that does not accurately describe you, then you will likely want to hold a lower amount of shares. If you are not sure, I encourage you to reach out to me to request a free Investor Analysis that provides scientific results into how you feel about various aspects of risk you have when it comes to your investments. The better your employer stock purchase plan, the stronger the argument is to maximize this employer benefit, as the potential for a guaranteed return is too good to pass up. The biggest risk by far is not having a strategy or plan of attack to manage your shares as they begin to accumulate. Already accumulate a significant amount of employer stock? Check out my YouTube videos that offer a few strategies to reduce your exposure over time. Use the upper left drop down to choose the video you would like to find out more about.